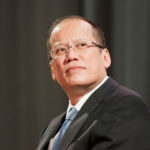 MANILA, Philippines – Martial law victims fighting to ensure that such a dark period in history will never be repeated are not necessarily bitter or vengeful, according to former president Benigno Aquino III. In fact, Aquino, whose family was a victim of the Marcos dictatorship, said some of them were a personal source of inspiration for being able to move on with grace despite what they had been through. The former president was asked about the people he looked up to aside from his parents who were democracy icons. Former senator Benigno Aquino Jr. was assassinated in 1983 after a long battle with the late dictator Ferdinand Marcos. His mother Corazon was installed into the presidency when a bloodless people’s uprising occurred three years after the assassination. Aquino said that an aunt and the nanny who took care of him when he was young were both oppressed during martial law but he never heard them talk about “getting even” or wishing that their persecutors experience the same things that happened to them. Aquino disclosed his nanny, who was six months pregnant, was arrested three times during Marcos’ time. The only offense he could think of was that she was under the employ of a family seeking democracy. Aquino had also been talking about the sufferings of his family while his late father was incarcerated for seven years before they went into exile in Boston. A documentary shown during his last Independence Day rites at the Palace was again screened during the informal forum on the night of Sept. 23 at St. Theresa’s College in Quezon City. It was the day that martial law was implemented though it was signed on Sept. 21, 1972. Aquino also cited former lawmaker and Commission on Human rights chair Loretta Ann Rosales as among those who were not thinking of personal vengeance while continuing to defend human rights. Listening to them could make people pause and think: “Why is the hatred of the nuisances… deeper?” Aquino said, adding these people must have found the “grace of God” in their sufferings. Another idol, he said, was South African anti-apartheid revolutionary, politician and philanthropist Nelson Mandela, who was incarcerated for 27 years but held no rancor against his enemies. Aquino said he had a one-on-one talk with Mandela, who was president of South Africa from 1994 to 1999, when he came here in the country and met with his mother. Aquino said Mandela, during his detention, was reportedly being poisoned little by little, and “to see somebody without bitterness” after all of that was remarkable. “(I was) trying to imagine how, (while) you were oppressed for so long you were filled with anger… I have so many examples,” the former president said. But despite being passionate about the martial law issue, Aquino said the issue on whether Marcos should be buried at the Libingan ng mga Bayani was beyond him. “I’ve kept quiet about the Marcos burial because I’ve got so many years to say my point and it’s time to hear everybody else’s point,” he said, noting the vocal opposition of various sectors when President Duterte announced his approval of the burial. “They have shared their own stories,” he said. Supposedly scheduled this month, the Marcos burial at the heroes’ cemetery was halted by a status quo ante order issued by the Supreme Court, where various oppositions were filed by victims of human rights abuses during the martial law years. During the gathering on Friday night, Aquino stressed the importance of keeping a permanent record to prevent attempts at historical revisionism. Those opposing the burial of Marcos at the heroes’ cemetery believe that the state should not pay tribute to a dictator or it will send the wrong signal to the young generation.